Hawks on both sides are a problem, but President Obama has to seize this opportunity. 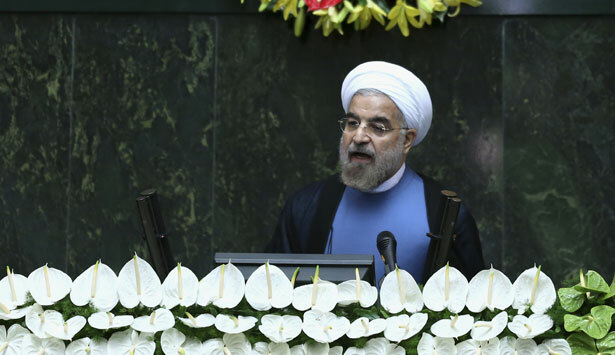 President Obama could have been more effusive in welcoming the start of Hassan Rouhani’s term as president of Iran. But it could have been worse, too. Regardless, we should find out over the next few months if Iran and the United States can work out a deal that includes, at the minimum, Iran’s nuclear program—but which could extend to Syria, Afghanistan and Iraq, too. Diplomacy, however, will take many months, if not years. On the occasion of Dr. Hojjatoleslam Hassan Rouhani’s inauguration today as the Islamic Republic of Iran’s seventh president, we again congratulate the Iranian people for making their voices heard during Iran’s election. We note that President Rouhani recognized his election represented a call by the Iranian people for change, and we hope the new Iranian government will heed the will of the voters by making choices that will lead to a better life for the Iranian people. The inauguration of President Rouhani presents an opportunity for Iran to act quickly to resolve the international community’s deep concerns over Iran’s nuclear program. Should this new government choose to engage substantively and seriously to meet its international obligations and find a peaceful solution to this issue, it will find a willing partner in the United States. But the apparent olive branch comes amid hawkish calls in Washington for tougher sanctions on Tehran and the possibility of military action if no resolution is found. In a letter sent to President Barack Obama, 76 senators demanded tougher economic punishment for Iran until the Islamic republic scales back its nuclear ambitions. It also urged Obama to keep all options on the table, while keeping the door open to diplomacy. The effort to dismiss Iran’s elections as unimportant—despite millions of Iranians’ willingness to come out and vote for Rouhani—and forge ahead with sanctions stem largely from efforts backed by the American Israeli Public Affairs Committee (AIPAC). The latest sanctions bill, the Nuclear Iran Prevention Act , which passed the House 400 to 20 last night, would impose the as yet toughest measures to date, just days before Rouhani’s inauguration. With AIPAC backing, the bill got 376 co-sponsors before Rouhani’s election. Some 80 of those were among the 131 members who signed a letter pushing diplomacy and urging restraint—but that letter took no positions on new sanctions. In another letter yesterday, 16 members of Congress urged that the bill be delayed on the grounds that it would be “counterproductive and irresponsible to vote on this measure before Iran’s new president is inaugurated.” The 16 called for the bill to be revamped to strengthen presidential waivers to sanctions and make clear it doesn’t authorize the use of force. Rouhani has focused heavily on rebuilding Iran’s economy, crippled by shortages and high inflation—and of course, a big part of that is the result of economic sanctions imposed by the United States and its partners. Rouhani rightly calls them “oppressive,” but ending them depends on an agreement with the United States. He’s sending lots of positive signals that he wants a deal, including the naming of an apparently non-confrontational cabinet made up mostly of technocrats affiliated with former President Ayatollah Ali Akbar Hashemi Rafsanjani, who endorsed Rouhani for president and who sat next to Rouhani during his swearing-in. Potentially the most significant appointee was Javad Zarif as foreign minister, who last served in that post from 2003 to 2007 (under President Khatami, the leader of the reformists), and who is associated with the failed effort to convince the George W. Bush administration to engage in a Grand Bargain with Iran. Mr. Rouhani’s choice for foreign minister, Javad Zarif, raised the most eyebrows. Mr. Zarif, 53, has lived half his life in the United States, is a fluent English speaker and served from 2002 to 2007 as Iran’s ambassador to the United Nations. He was also part of Mr. Rouhani’s nuclear negotiating team, which in 2003 struck a deal with European nations to temporarily suspend uranium enrichment. But the focus on [Rouhani’s moderate traits] suggests that Western elites still look for Tehran to accommodate the West’s nuclear demands—above all, by compromising Iran’s right, as a sovereign state and signatory to the Nuclear Non-Proliferation Treaty, to enrich uranium indigenously under safeguards. This motivates them to interpret Rouhani’s election as evidence of Iranians’ growing weariness with sanctions and, by extension, with their government’s policies that prompt escalating international pressure on Iran’s economy. The bottom line is that Iran is a complex country, with various factions and centers of power that don’t always agree with each other. Because Rafsanjani, a compromise-minded businessman whose priority seems to be to end sanctions, backs him, he has a constituency for a deal. Because Khatami backs him, he can bring along the Green Movement, which might otherwise try to block a deal negotiated by hardliners, as it did with Ahmadinejad’s proposed 2009 accord. And, because he has the support of the powerful (but not all-powerful) supreme leader, Ayatollah Ali Khamenei, Rouhani can expect support from that power center, too. Obama’s main challenge is to offer Iran a deal that is win-win. Why a deal with Iran is critical for addressing the civil war in Syria.